Successfully Added 10.1 Inch Dual System Tablet PC - Windows 10, Android 5.1, Quad Core Intel Bay Trail, 2GB RAM, 32GB Memeory, HD Display, OTG to your Shopping Cart. This high end tablet PC has the distinction of running two operating systems, Android 5.1 and Windows 10 – now you get the best of both worlds and can enjoy the Windows environment for your work and office needs and still maintain an Android system for games and media. Much like the powerful Chuwi Windows 10 tablet this 10.1 inch dual boot tablet runs on an Intel CPU. This intriguing device is certainly one for the gadget lovers as no matter what system your running you can make full use of a Quad Core Intel Bay Trail processor that allows 1.83Ghz max speed processing and is supported by 2GB of RAM as well as Intel’s 7Gen graphics for an awesome performance. The beautiful 10.1 inch display has a 1280x800 resolution that comes into its own when playing games or watching movies hanks to a good color depth and brightness. This will ensure that all you media is presented in high quality but should you demand a larger viewing platform you can always connect a big screen via the HDMI port. What’s more with a OTG port you can turn this device into a computer by adding in peripherals or use its Bluetooth connectivity to connect a mouse and keyboard when you need to get some serious typing done. With a substantial 32GB of storage space and micro SD support allowing you to increase that to 96GB this dual system tablet has ample storage space. You can use Wi-Fi connectivity to browse the web or if that's not available the tablet can be used with a 3G USB dongle for mobile data connections. 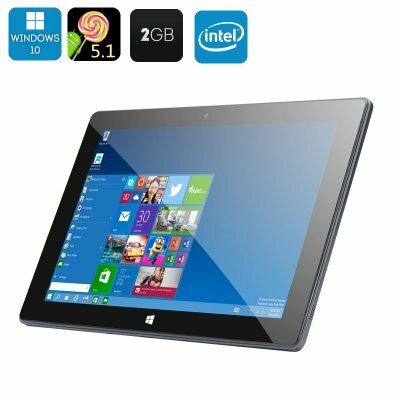 A perfect portable computer with as much as 8 hours of usage time this dual system 10.1 inch tablet PC comes with a 12 months warranty, brought to you by the leader in electronic devices as well as wholesale tablet PCs..
- Full size USB port and microUSB! Just got it started playing with it so far so good I like it.